Before the masters of Enron and WorldCom ripped off innocent investors, there were the connected “Guys” in bucket shops and chophouses. Here, Business Week reporter Weiss follows the adventures of one hustler on the shady side of Wall Street. Louis Pasciuto, a Staten Island boy, pulled down thousands a day in cash, tax free, by lying to rich people. Without a broker’s license, he easily dumped securities of scant value at invented high prices. (He got the license later—by hiring a ringer to take the exam.) The money flowed abundantly, and Louis couldn’t spend it fast enough. Limos at the ready, women even readier, fine raiment, and many Rolex watches (not the common Oysters, but top-of-the line Presidentials) couldn’t exhaust the torrent of dollars; Beemers, strip joints, and drugs couldn’t use up the take from naïve marks. Louis’s fanciful free enterprise was below the regulators’ radar. But his disorganized crime did not escape the notice of organized crime. The made Guys, the family capos, and the underboss skippers moved in, and soon Louis was under the arm of Charlie, one dangerous Guy. Charlie owned Louis, who had learned how to spend his money. He gambled and lost, big time. In the psychotic world of payoffs in paper bags and regular beatings administered by Guys like Charlie, what was a husband, father, and debt-ridden crook to do? Louis went to the Feds. The refugee from the underclass went undercover and wore a wire. With the mounting heat from a government now attentive to racketeering, with more media scrutiny and a nasty bear market, a lot of Guys sported prison stripes instead of pinstripes, and the game was pretty much over. Who knows what scam is next? Inevitable allusions to The Sopranos aren’t necessary. 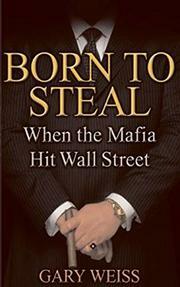 The cautionary saga of gangsters on Wall Street, told with insight and great wit, grips as tightly as a loan shark.